Really? You ask. A 6 Week Half Marathon Training Program? Is it even possible. This program was designed for you in mind, my time-constrained, race-junkie, run-loving friend. You are run-loving, right? Who is a perfect runner for this plan? First of all there is no perfect runner. Those who just love cranking out those half marathons for the fun of it. The occasional runner who has a solid fitness level. 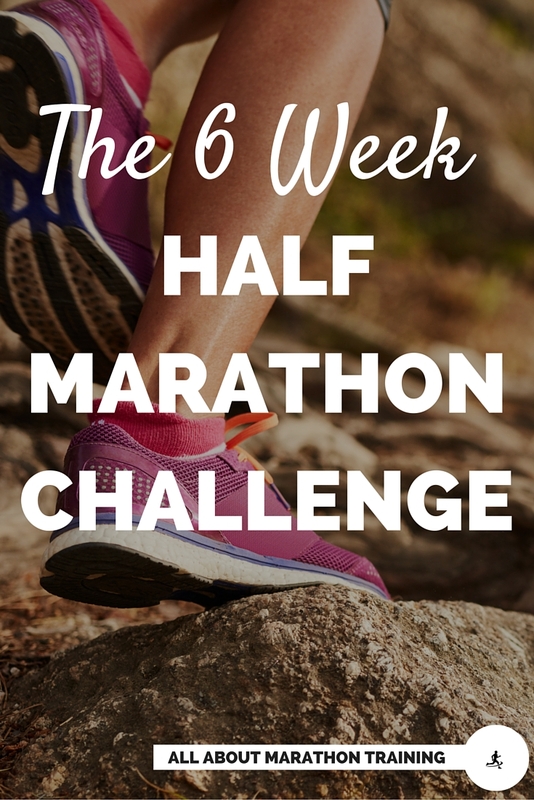 Ok, so just how hard is this half marathon training program? Well, that is a very subjective question. But, besides building up your endurance, the training week probably looks very similar to a regular running week that you undertake right now. The only real difference is that we are building that endurance level through the long run on the weekend. Since the focus is on the long run and completion, I do not suggest this plan for someone who wants to set a PR on their next half marathon. It can be done, but the plan is more designed to just bring you to the finish line and that is why there are only easy runs and endurance building long runs versus a variety of hills, tempos, interval trainings and the like. Let’s talk a little about your training schedule as a whole. Each week you will be running at least 4 days. One of those days (scheduled on each Saturday) is considered your long run which will progress by an additional 2 miles each week (10% increase) with a final long run of 11 miles. Rest days are given twice a week. Take these seriously and just rest! You’re body needs it. It has to put up with you being so amazing. Cross training will be done on Thursday and is marked on the training plan as, “XT”. If you choose to do aerobic exercises for cross training then work for about 30-40 minutes. If you choose strength training as your cross training then limit yourself to no more than 20 minutes. Where should I send your FREE 6 Week Half Marathon Training Plan? Thank you! 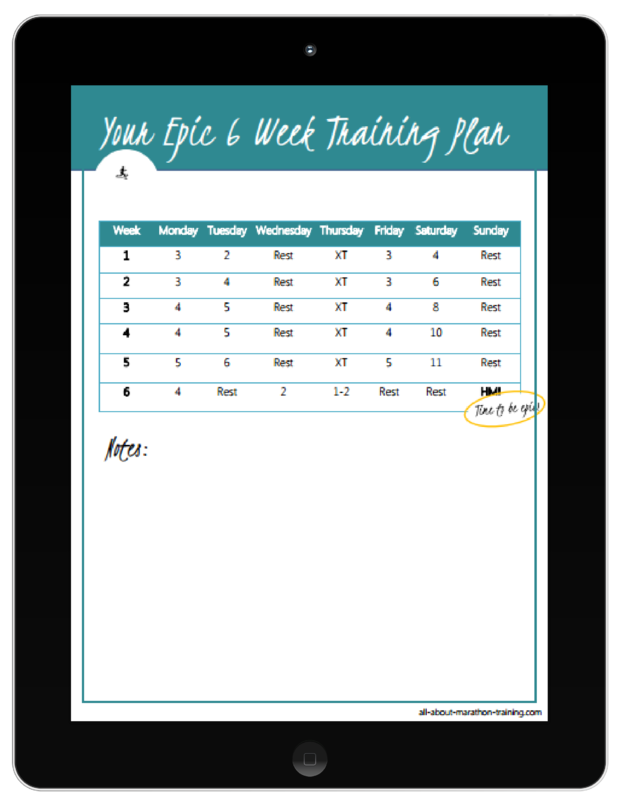 Your training plan is on it's way to your inbox! Send me the FREE Training Plan! Since it is such a short span of time to be training for a half marathon, try and find someone to hold you accountable. You don't have time to be messing around and skipping out on runs since there is no room for make-ups. This is Go Time! Challenge yourself and get out there. There are only 1008 hours left until your training is complete!